The Saudi Arabian alliance, of which the US is a member, has cut off the flow of humanitarian aid into Yemen and the results are catastrophic. As previously reported, civilians in Yemen are suffering from an intense and widespread humanitarian crisis. Staggering numbers include 7 million civilians in starvation, and 19 million out of the country’s 27 million population “in need of some form of aid.” However, all of this has just gotten far worse thanks to a blockade on humanitarian support carried out by Saudi Arabia and aided by the West. It is nothing short of genocide. Yemen has been devastated by more than two years of civil war, fostered by the Saudi Arabian government and supported militarily by the United States. President Abd-Rabu Mansour Hadi’s government is backed by the Saudi-led coalition and is fighting to drive the Houthis out of cities they seized in 2014 and 2015. 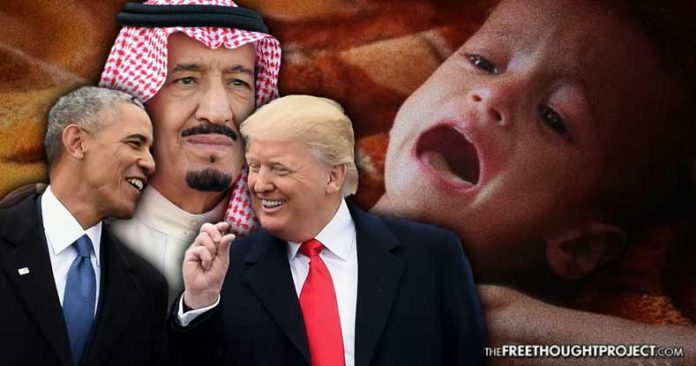 Since the beginning of the US support for Saudi Arabia in Yemen, started by Obama and continued by Trump, thousands of innocent civilians—including children—have been slaughtered in the war. In spite of the fact that the Saudis have been caught dropping US bombs on schools, hospitals, and marketplaces, directly targeting civilians, the US continues their support. Last week, Houthi rebels in Yemen allegedly launched a ballistic missile toward the Saudi Arabian capital of Riyadh. In response to the attack which killed no one the Saudis placed a blockade on all flights in Yemen, including humanitarian aid. The blockade has stopped the flow of the much needed medical supplies and food and is on the brink of causing the largest genocide by starvation in modern history. After briefing the UN Security Council last week, Mark Lowcock, the UN’s humanitarian chief, said the move will worsen a “catastrophic” humanitarian crisis that has pushed millions to the brink of famine and has caused a mass cholera epidemic, reports Al Jazeera. “I have told the Council that unless those measures are lifted … there will be a famine in Yemen,” Lowcock, who visited Yemen late in October, told reporters last week. However, in spite of Lowcock’s warning, the west has refused to act. Children are being deliberately starved to death at the hands of a US Ally and the west is complicit by not only failing to step in and stop it but actually aiding it. According to recent reports, sales of weapons to the Saudis by the UK have increased by nearly 500% since the start of the slaughter in Yemen. Instead of decrying the mass starvation and genocide and pointing out the obvious—that Saudi Arabia is buying the West’s silence through the purchase of weapons—Trump praised the largest weapons deal in history with the Saudis last week. Millions of children are starving to death and the United States government is praising the sale of weapons to the country carrying out the starvation. The recent blockade has become so horrific that other countries have begun to speak out, yet no one is taking action. “I hope there’s increasing awareness around the world about the magnitude of the crisis in Yemen,” said Australian Suze Vanmeegen, the Yemen advocacy advisor for the Norwegian Refugee Council. “The impact of the current blockade is massive. We’re looking at a population that is larger than Australia’s. Their risk of a famine or a crisis that is unprecedented is very, very high,” she said. Apparently, the cost of maintaining ‘freedom’ in America now involves aiding a terrorist nation in the starvation of an entire country.